Kyntronics Smart Hydraulic Actuators (SHA) are a showcase of simplicity. Offering flexibility, reliability, and precision over traditional electromechanical (EMA), Hydraulic and pneumatic solutions. With traditional EMA systems, a motor is mechanically coupled to an output shaft to create linear motion. Backlash is introduced to the system and worsens over time. Another shortcoming of most electromechanical solutions is that they can be "back-driven". This means that a load can drive the output shaft backwards if the drive is not powered, thus introducing the need for a brake to hold the load at position when the drive is at rest. The traditional Hydraulic solution is not without it's shortcomings as well. While providing an extremely high power density, rapid cycling, and no need for a brake; most hydraulic systems require maintenance and are inefficient. There is generally a network of hoses and fittings that may leak over time, and a variety of filters to replace at regular intervals to ensure fluid cleanliness which helps guard against premature component failure. In addition, precise and coordinated position control can be difficult and expensive to achieve. Pneumatic systems are inefficient to run and costly to maintain as well, sharing in many of the drawbacks inherent to traditional hydraulic systems. 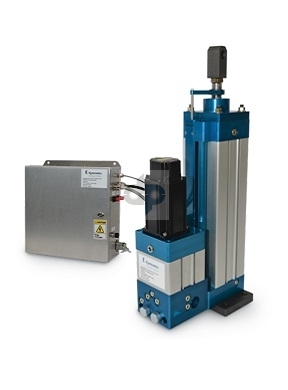 The Kyntronics Electro-Hydraulics Actuation solution combines most of the advantages of these traditional systems, without many of the disadvantages. 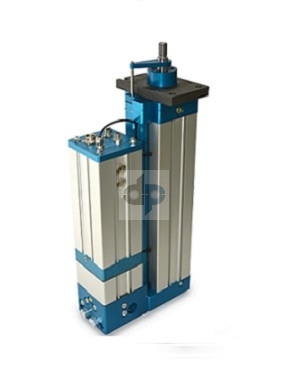 An electrohydraulic actuator integrates a hydraulic cylinder with a controller, motor, pump, reservoir, and control manifold into a self-contained maintenance free solution. Kyntronics combines a drive, servomotor, manifold, and cylinder within a self-contained package. A key element of the Kyntronics EHA is a rod-volume compensating mechanism, which compensates for the differential volume between the cylinder’s rod- and cap-end volumes as the piston rod extends and contracts. The rod-volume compensator uses closed cell foam wrapped around the inner pressure cylinder. The modular system starts with a bidirectional ac or dc servomotor driving a gear pump. This eliminates the need for a proportional directional valve because the motor controls flow rate and direction. When no pressure or flow is needed, the motor consumes no energy. When holding force with no motion is required, the motor maintains torque to hold pressure. The Kyntronics solution provides power on demand and delivers the most efficient (50% to 80%) method of converting electrical power to mechanical power. Overall efficiency using a combination of hydraulic and electrics far exceed that of other methods. Call us to find out how Kyntronics motion solutions can save you on costs and cut your overall maintenance needs!